I’m going to put it out there that if you don’t own an Ergo carrier, someone you know does, that’s how popular they are. Ergonomic (hence the name! ), easy to use, comfortable, dad-friendly – they’ve got a lot going for them. Ergobaby (the company) has done a marvellous marketing job and has significant market share. An Ergo is a soft structured carrier (SSC). Ergos have been around for more than 10 years, so together with the Baby Bjorn, have long been the carrier of choice for parents. Babywearing has come a long way in 10 years and with its popularity on the rise, there have been many new players join the market. One of the most popular newcomers in the SSC market is the Tula, which was been on the market for around four years. And I’m certainly not alone in my musings – one of the questions I see repeatedly in babywearing circles is what is the difference between the Ergo and the Tula? Which one should I buy? So without any more ado, Ergo* vs Tula: the great debate! * Disclaimer: this post does not include any information on the new Ergo 360 baby carrier, as I have not tried it and it is quite a different fit to the other Ergo carriers being a four-position carrier, including the option to forward face, which is not something I particularly recommend. The Ergo comes in a range of different models including Original, Performance and Sport as well as special edition fabrics and an organic edition. They range in recommended retail price from $169 to $269. They are, however, sold in many retail chains and are regularly on special so can be picked up for much less. They are also often sold second hand for reasonable prices, potentially even under $100 if you’re lucky. The Tula comes in two sizes: standard and toddler. It also comes in two formats: canvas or wrap conversion (which means it is made wholly or partly from a woven wrap). A standard canvas is $179 and a toddler canvas is $189. Wrap conversions on the other hand, range from USD$199 for a semi to over USD$350 for a full, depending on the wrap used. Tulas are currently holding their value incredibly well, and are very rarely sold second hand for much less than the retail price. Wrap conversion Tulas are very limited and therefore often demand higher than retail price in the second hand market. This is where the differences really come out to play. The Ergo is available in just about every baby store in Australia, as well as many online retailers. This is one of the reasons why they are so popular and widely used. The Tula is not available in a bricks and mortar store in Australia, and has a handful of Australian online vendors. Limited numbers of canvas Tulas are generally always available, but can sell out for periods of time. They can also be purchased directly from Tula in the US or a few US online vendors. Wrap conversion Tulas are sold directly from the Tula website, with limited numbers released once a fortnight, and are sold out within minutes. There is a very active Facebook trading community for pre-owned Tulas, though, which is often the best place to get a wrap conversion Tula. The ability to try an Ergo on in a bricks and mortar store is one of the reasons why many people choose the Ergo over the Tula. Some people like to see and feel before they purchase. Babywearing meets are often the best place to try a Tula, most groups have some members with Tulas that they’re happy to show interested people. One of the main reasons Tulas have become very popular is that many babywearers feel they fit better than an Ergo. The main difference in the fit is the shoulder straps. Tulas have a narrower, curved strap with quite dense padding, compared with the Ergo’s wider, straight strap. The curved strap is often a better fit for smaller framed people, who may feel the Ergo straps are a bit too wide or bulky for their shoulders. The Tula also has what are called Perfect Fit Adjusters where the shoulder strap meets the body panel. By tightening this adjuster it provides a snugger fit, particularly for smaller babies or back carrying, when you want baby’s weight as close to you as possible for balance. Ergo comes in a number of models including an X-tra model, to fit larger and taller people. You can also purchase a waist extender that fits on the original Ergo. Men often find the fit of the Ergo suitable, as they are generally a lot wider through the shoulder so the strap width is a better fit. The standard Tula has a slightly bigger panel size than the Ergo, by a couple of centimetres, and has deeper seat darts. The Tula also comes in a toddler size to fit children 18 months plus, when most children are starting to grow out of the standard Tula or Ergo. Both the Ergo and the Tula require an infant insert to carry a newborn up to around four months old, which has to be purchased separately. While there are a few print options available on Ergos, another one of the reasons for Tula’s popularity has been their array of cute, funky and classic designs on their canvas range. That you can get a soft structured carrier made from your favourite woven wrap is another big selling point, despite the higher price. Most models of the Ergo include a zip up pocket on the body panel. It’s big enough for a purse and a nappy. To be honest, I never used it, but I know lots of people do, and are disappointed that the Tula does not have a large pocket. The Tula has a small pocket on the waistband, which will fit an iPhone, some cash/cards, or a small set of keys. The hood of the Tula does not have any reach straps, which makes it basically impossible to reach when back carrying, so if you want to use the hood when bub is on your back (and you haven’t got your husband/friend/older child to help you) you would need to make or purchase reach straps. Quite possibly the most important difference between the Ergo and the Tula that everyone needs to be aware of is that there are many counterfeit Ergos on the market. They are available from online eBay stores, or second hand from Gumtree or other trading sites, and are cheap. They seem too good to be true, and they are. Besides the fact that buying from a counterfeiter is unethical, there is no way to know whether fake Ergos have been safety tested or that the fabric has used child safe dyes for example. It is not worth the risk – the only way to know for sure that an Ergo is real is to purchase from an authorised vendor, or see proof of purchase if buying second hand. To date, there are no fake Tulas on the market. Both the Ergo and Tula are great quality, comfortable baby carriers for women and men, and can be used from birth until toddlerhood. If all you had to carry your baby was one of these, you’d be doing great. Whatever you decide, these carriers will help you keep your baby close and content, and that’s the main thing! PS: If you weren’t confused enough already, remember, Ergo and Tula are only two of a number of great soft structured carriers on the market. Got your eye on a soft structured carrier and interested to know how it compares? Drop me a line. Categories: Uncategorized | Tags: Babywearing, ergo, soft structured carrier, SSC, Tula | Permalink. Thanks for this ppst! I have long been wondering what the difference was & how they compare to each other! I have an Ergo but thinking I need another carrier & have been eyeing off the Tula and the Angelpack. I’m thinking the Tula might suit me better, but going to try an Angelpack soon too. I haven’t tried an Angelpack, but I hear they are good for smaller frames and also that you can cross the straps for front carries, which some people quite like. I am actually enlightened. But I was confused before. Thanks for doing the research and sharing. Thankyou for this. Just wondering if you had any thoughts on manducca carriers? The Manduca is a great carrier. Some of its advantages are a built in infant insert so you don’t have to buy a separate insert, and you can cross the straps in a front carry, which some people like the feel of. my DD and I loves ergo! Love my Ergo! Never tried a Tula, thanks for clarifying the differences! Thanks for the post you explained the confusing world of SSCs so well. Any thoughts on the Madame Goo Goo? Thank you! I haven’t really tried a Madame Goo Goo myself, but I have seen a few at local meets. They are a good carrier, and some of the benefits are that if you order a custom one you can have it made to the size that suits you, which can be helpful if you are struggling to find standard off the shelf carriers that fit you well. Thank you for the comparison. It was really helpful. I’m 6 months pregnant with my first and can’t decide which soft carrier I will choose as there are so many. I have a baby bjorn we and I know you said they have been around for 10yrs along with the ergo but are they as good for bubs hips Ect? I find they don’t get much of a mention compared to Tula, ergo and Manduca so wondering if I should return it? Hi! It depends on what type of Bjorn you’re talking about. Early original models are pretty outdated these days, they’re not necessarily unsafe, and if your baby hasn’t got a hip problem it wont cause one (but if they do have a hip problem, the leg positioning isn’t ideal), but they’re not particularly comfortable for the wearer or the baby. Some of the newer Bjorn models, like the One, have tried to improve the seated position for baby, and provide some additional back support for the wearer, but in my opinion, for the price, you would be much better off with something else. The design of the newer bjorns still has baby’s weight hanging off your shoulders, rather than supported by your hips like the Ergo, Tula and Manduca. If returning it is an option, I would definitely consider it. For a newborn, the Ergo and Tula require separate infant inserts, which can be a bit fiddly, and hot in the summer, so a Manduca might be preferable. Or perhaps have a look a the Lillebaby or Kokadi Flip also, which are good carriers from newborn without the need for an insert. Good luck! have you heard of the babasling? I got it as a gift and we didn’t use it much till I scored a cheap RS. Hi Tiffany. Babaslings are an older style of carrier that shouldn’t be used with a newborn, but can be ok for a hip carry with a baby who can sit unassisted. Though they aren’t very adjustable, and therefore not the most comfortable option on the market. A ring sling is a better option. Can you speak to the differences between canvas and woven wraps, toddler vs standard, wt limits, and half vs full? The standard carrier has a weight limit of 45 pounds, the toddler 50 pounds. A half means that the outside fabric of the carrier is made from woven wrap, with the inside layer canvas. A full is completely made from woven wrap. There isn’t really any difference between a canvas and a woven wrap tula other than appearance and exclusivity, though if you had a full woven wrap carrier it can be a little less “firm” as most wraps are softer and bouncier than canvas. Some people therefore prefer a half when carrying a heavier child. I was originally looking at getting an ergo, but have thought about a Tula for my 7 month old (8.5kg) baby. I am more of a larger frame and my husband is 6’5″. Would we be better with the ergo? Hi Lucy, sorry for the very late reply. I think and ergo and a tula have very similar webbing lengths, so would both be suitable, unless you need even more size than that and then you can get an “Xtra” Ergo, which Tula does not have a comparable product for. Have you heard about Amazonas carrier? We are thinking about getting an ergo 360 or ergo as not too sure on the front facing option but we won an Amazonas so not sure if it would be double use. I find the amazonas very nice and comfy to use but baby seems to slide sideway in it so not sure he is that comfy (he is a big baby nearly 5 months). I mainly use a sling to carry him at the moment but would like a fast ergonomic carier. 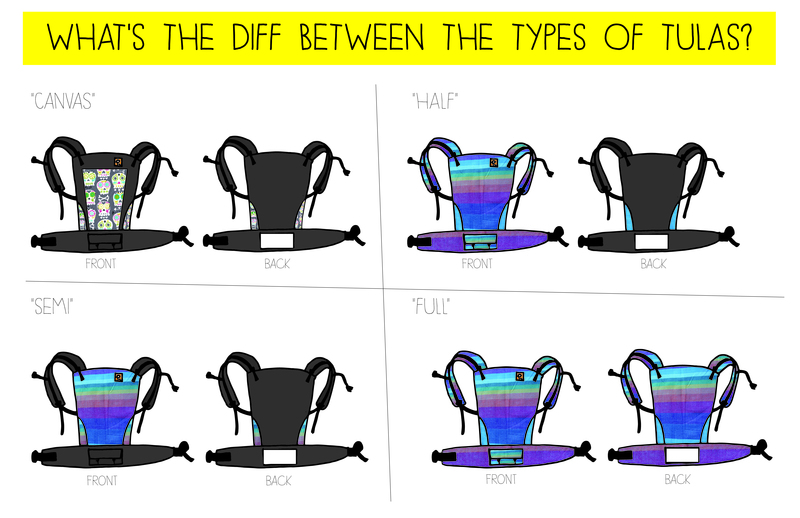 Your article is also making me rethink the tula…arrgghh I find it so hard to choose. There is no way I can try a Tula though and I am not a petite build. My oh is a rather tall and broad person too. Would the Tula be too small for us? Sorry for my very late reply. I have never heard of Amazonas, but I’ve just had a look at the website, they look like good carriers. I think the Tula has quite a lot of length in the webbing so I think it would likely be ok for you, I know plenty of larger people who use them. Perhaps see if you can find a vendor that has a returns policy just in case? I am SO indecisive! I’ve been wanting a standard canvas Tula, but they are quite expensive. I can get an ergo for half the price when they are on sale. I had a bijorn with my son, but it really hurt my back. Would you consider the Tula and Ergo the same as far as comfort? Hi Allison. I think if budget is an issue for you then an ergo is a great option. They are far better designed and comfortable than a Bjorn, and while i do prefer my tula over my ergo, it is a marginal difference and personal preference – and the ergo is a great carrier, which you’re absolutely right, you can often get on sale for a great price. I have an ergo original with an infant insert. I used it one time when my baby was a little over a month old. He’s already hot-natured, but I guess the extra padding of the insert was too much. He got so hot that he cried the whole time. When I took him out he was soaked with sweat. Does the Tula have less padding? Or do you have any other suggestion for a “less hot” carrier? Hi Melissa, all infant inserts are going to be quite warm if the weather is also warm, you need to consider what clothes baby is wearing. If you want a carrier without an infant insert, there is a new Ergo that has no insert, the Manduca, the Lillebaby or a Kokadi Flip. A mei tai that suits a newborn like a hop tye, mysol or didytai might also be of interest. How about lilliebaby carrier? Any thoughts. Thank you for the post. I noted that you mentioned you don’t recommended baby carrying with baby face out. I was wondering why that is? Thanks so much! My philosophy is that outward facing isn’t really necessary – it’s not an ergonomic way for the baby to sit nor an ergonomic way for you to carry the weight of the baby. Even the newer carriers that aim to provide a more ergonomic position for outward facing, still don’t provide as good an ergonomic position as facing in, a hip carry or a back carry. I also think that many children under the age of 1 (after which carrying outward facing becomes very difficult due to weight and size) get overstimulated by facing outwards without anywhere to turn away from lights, noise and other people, particularly in places like shopping centres or busy areas. If you wanted to face your baby outwards at a small family gathering so baby could interact with other family members, then sure, I could see how that would work, and if you caught the bus regularly and you sat down with baby in your lap outward facing then I could see how that might be useful too. Outside of those examples though, I can’t see many real reasons to face a baby away from you, when facing in, hip carry or back carry should be sufficient for your needs. Hope that helps! I debating between the ergo and Tula. I want one for Florida weather and comfortable for baby and me. I ll be wearing it daily mostly around the house and for shopping. Which one would you suggest?? Thanks in advance! I’m in Australia so I can’t help you out with which one would be better in Florida weather, but both are great carriers, it’s often a matter of seeing if you can attend a local meet and try both on and see which you prefer. Sometimes cost comes into it, new they are a similar price, but you can get second hand ergos much cheaper (watch out for fakes). You don’t mention how old your baby is, but both the ergo and the tula require an insert for a baby under 5 months, so if your baby is younger, you might like to look at a carrier that doesn’t require an insert. Ergo very recently released a new carrier that doesn’t require an insert called Adapt. There is also the kokadi flip and lillebaby that don’t require an insert. Happy babywearing! Thanks for responding so quickly. He’s 7 weeks old. And I need s carrier that will keep him cool. Any thoughts on baby Bjorn?? Or any other ones you might suggest?? Hi Ariella – I don’t recommend the Baby Bjorn, although there has been improvements in its design over the years, it still does not provide a particularly ergonomic position for baby or the wearer, the weight hangs off the shoulders instead of the hips. 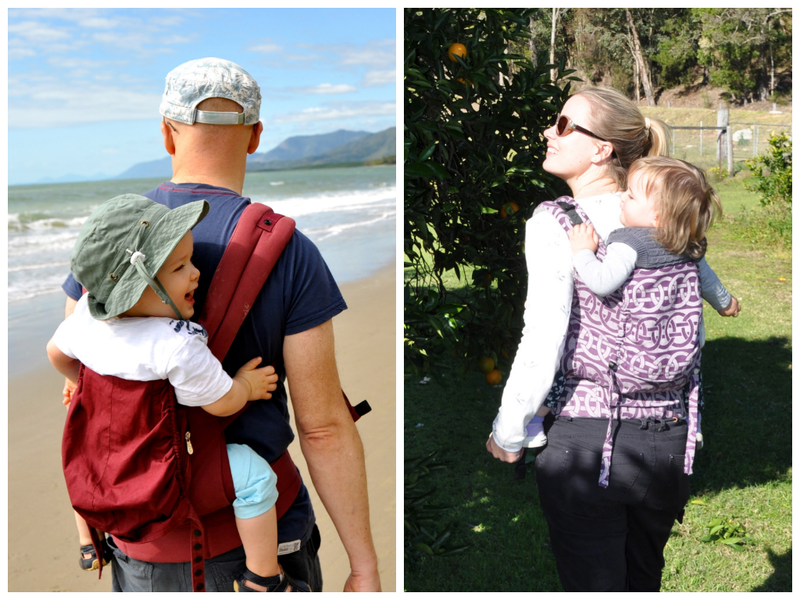 Most other carriers on the market would be suitable for your friend – some of the best ergonomic carriers on the market include the ergo, manduca, tula, lillebaby, kokadi flip, pognae and emeibaby. There are others, but this is a good place to start. If your friend has never carried her baby in a carrier before she will probably need to consider doing some work on her strength and start off with short carrying periods to get used to it. Some carriers come with options like mesh to help increase airflow in warm climates, though keep in mind if it is hot, babywearing is hot, you just need to dress appropriately and keep your fluids up. All the best. For a 20 lb 8 month old would you recommend buying the Tula toddler? Thanks! Hi – no, a toddler sized Tula won’t fit until at least 18 months old, sometimes older. Thanks for your reply! I have the ergo but feel like I need something a bit more structured since my lil dude hit the 20 lb mark. Wasn’t sure if toddler Tula was just about weight or other factors. Maybe I should just start exclusively back carrying.